Once again the ALGS was lucky enough to be selected to participate in the Hampton Court Palace Flower Show Window Box and Hanging Basket Competition. The competition now is divided into 5 categories: Bountiful Blooms, Edible, Low Maintenance, Wildlife Friendly and Scented. We chose "Bountiful Blooms" as our category and as each exhibit also had to have a title we decided on "Firework Fantasy". It's important to note that the exhibit is judged on the box and basket being a matched pair and on how well the title is interpreted in the planting design. Activity commenced around Easter with the purchase of Phormiums and Alliums to provide a distinct impression of firework movement and then the more traditional fuchsia, pelargonium, petunia, lobelia, bocappa and verbena. Unfortunately the Alliums didn't appreciate the transplanting so late in the season and despite a valiant effort to continue growing, the leaves gradually withered and died. The growing season has been diabolical this year with summer occurring in April so that both the box and basket had to be moved out of the glasshouse during the day but moved back inside each night because the night time temperatures were still the norm for that time of year. By the time they could be left out 24/7 we had moved to "April showers" during June with at least two nights of threatening frosts. The end result was powdery mildew on the petunia and late budding and subsequent flowering of the fuchsias. 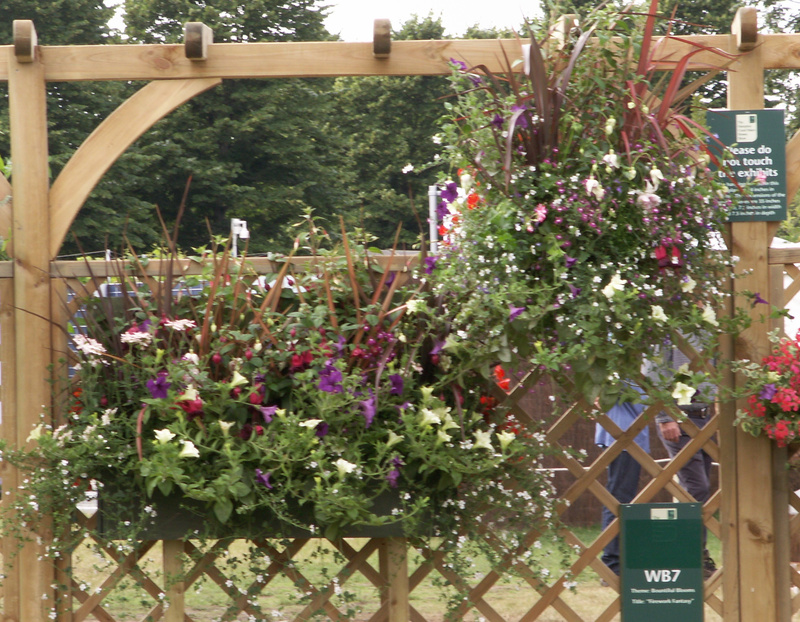 Still, come the day of staging on Monday 2nd July the Box and Basket was sufficiently well developed for us not to be ashamed to take it to the Palace and obviously the judges thought it wasn't too bad either as we were awarded the Silver Medal in the Grenfell Range. To see the Gold (and the only Gold, therefore the Best in Show) and the Silver Gilt exhibits click here.